Wow! That is one huge but really stunning quilt. Awesome job! How many hours did it take to quilt this one? Wowser! Congratulations on this large and lovely finish! My goodness...all those pieces! And double congrats on the backing fabric purchase! Looks like you had some fun hanging this quilt up for pictures! Beautiful! That binding fabric is a favorite binding choice of mine. 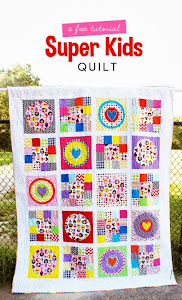 Your quilt makes me want to check out the pattern and make one too :) I'm a big fan of this one, Laurie! You know I love Washi, and seeing Washi in this quilt just makes me smile. This turned out awesome. I really like how you can see different patterns when you look at the quilt from far away. Great job!!! Your quilt is fantastic! I love all the fabrics and love a nice big quilt! Absolutely gorgeous! 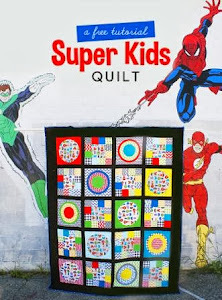 I'm a sucker for big quilts, so this one is right up my alley. Love the backing - what a killer deal you got! Wow! What a beautiful quilt! I love how the colors all work together so well! This is a gorgeous finish - I just love it! I meant to ask you today about the washi tape fabric. It was such a perfect compliment and matched all of your colors perfectly! Did you use that fabric as your color inspiration to start with or was it just a perfect fit after the fact?